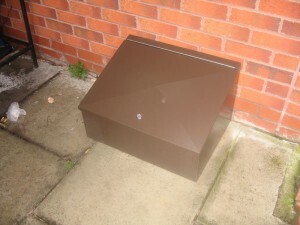 The OB23 is an aluminium box which covers a semi submersible meter box after they have been easily broken by accident or vandalized. It can be fitted with the door on top or in the front if the existing meter box if higher than normal. This can be done by using the extension piece which can be ordered separately. They are supplied in brown and come complete with all fixings. For more details and a view of a before and after, please click the pdf alternative contact Stuart or Phil on 01942 715678, who will be able to answer any questions you may have. This item and many more are available in our online shop, see the categories to the right or click ‘Shop’ at the top of the web site.